Instagram is a pretty popular app but it does have some restrictions. First and foremost, it doesn’t allow its users to download the photos that they’ve already posted. You’re also not allowed to download the photos that were posted by other people. So what if you decide to delete your old account and transfer all of your photos to your new account? Is there any way that you could download and save all of the photos that you have uploaded to Instagram? Well, it’s possible but you’ll need to use a free web service such as Instaport. 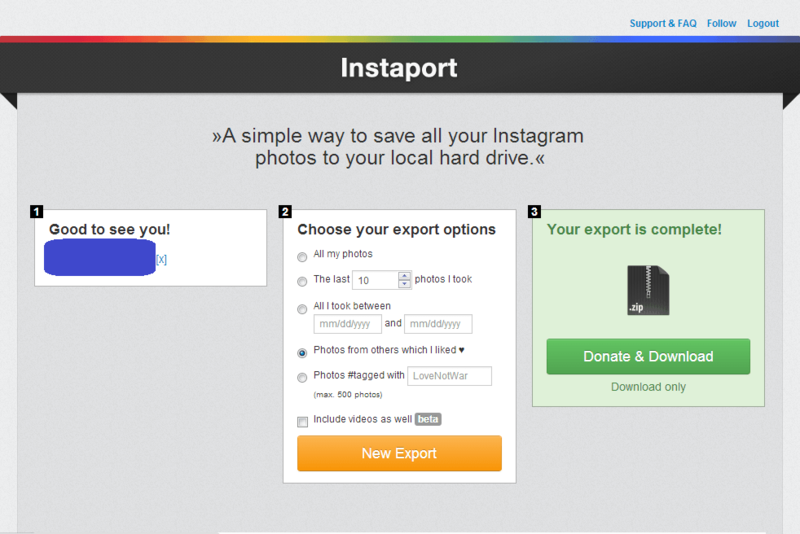 Instaport is a free web service that you can use to download and save your Instagram photos to your local hard drive. What’s great about this service is that you’re not required to download or install anything on your computer. Just load it online (see the link below) then log-in using your Instagram username and password. After which, specify the photos that you want to upload (ex. the last ten photos that you took) and then click the button for “New Export”. Wait for a few minutes for the service to generate your photo’s download link and you’re all set to save your photos to your local hard drive. Your photos will be saved as a ZIP file. Compatible with any type of web browser such as Chrome, Firefox, IE, etc. Instaport comes in handy for users who wish to download the photos that they’ve posted on their Instagram profiles. With the help of this free web service, you can easily export the photos to your local hard drive. What I like about this service is that it lets you choose the photos that you want to export. It is also very simple to use and there’s no need for you to download or install any additional software or application on your computer. The way Instaport works is also very straightforward. If you want to download your photos, just go to its official website and then log-in using your Instagram username and password. By doing so, you are allowing the web service to take the photos from your account. Once you’re logged-in, the web service will prompt you to choose your export options. This means that you can choose whether to download all of your photos or just the photos that you uploaded during a specific date or time. Apart from this, you can also use the web service to download the photos that were uploaded by others but this option is only limited to the photos that you’ve “liked”. You can also download photos with specific tags. For example, you can use the web service to export the latest photos with the #ThrowbackThursday tag. Just keep in mind that this feature will limit the total number of tagged photos that you can download to 500. Functionality wise, Instaport can easily process your request. As a matter of fact, it could only take less than a minute for it to generate a download link for the photos that you want to take from your Instagram account. Of course, the processing time may vary depending on the total number of photos that you want to download. It should also be noted that this tool will automatically compress and compile your photos into a ZIP file. So far, this web service proves to be really useful especially when you want to take all of the photos that you have uploaded before permanently deleting your Instagram profile. I also didn’t experience any problems while waiting for the service to generate the download link. I just noticed that this tool won’t let you preview the photos that you want to download. If ever you’re in the need of a tool that will let you download the photos that you’ve uploaded to your Instagram account, you can definitely rely on Instaport. This free web service is really simple to use and it also lets you select the photos that you want to download. It may have some downsides, such as limiting the number of tagged photos that you can download, but it’s already good enough to provide you with a quick and easy method to export the photos that you’ve posted on your Instagram profile. So go ahead and check it out.